Yesterday was one of those days. When we went to bed the night before, we knew that in the morning we had more to do than you want to imagine! We both had a list that needed to be accomplished. Driving both of us was a beautiful, sunny day before the forecast said it was going to start raining again. 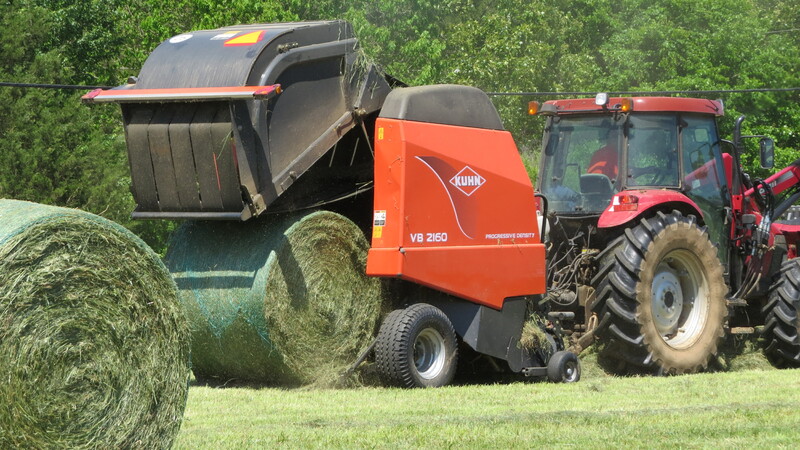 Gene had cut one small field of hay on Saturday afternoon. 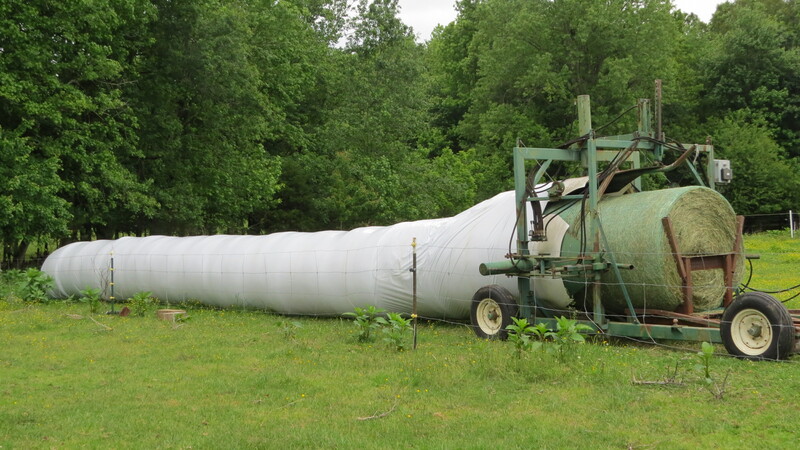 He knew he had only a narrow window of two nice days before the next rain but he felt he could get it done as he was planning to put the bales in a plastic tube. 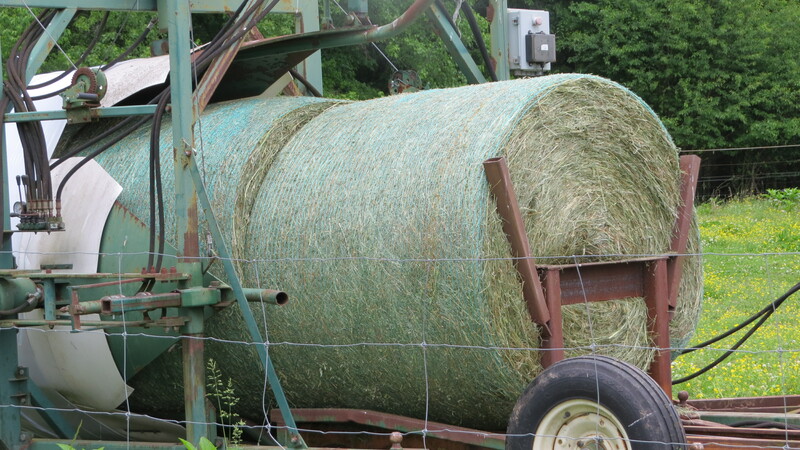 You want the hay to have more moisture (35-50%) when you tube it. Gene is an early riser and by the time my feet hit the ground at 7 a.m, he was already hard at it, feeding cows. Of course when there is a time crunch, things go wrong. He had a flat tire on the mixer wagon that had to be fixed so he could get the cows fed. While he was feeding, he found a cow with wire wrapped around its head and feet. He had to catch her and cut it off. Soon afterwards he got a call from Steve, an employee and fellow beef farmer, who had a cow tangled in barb wire and he needed help. 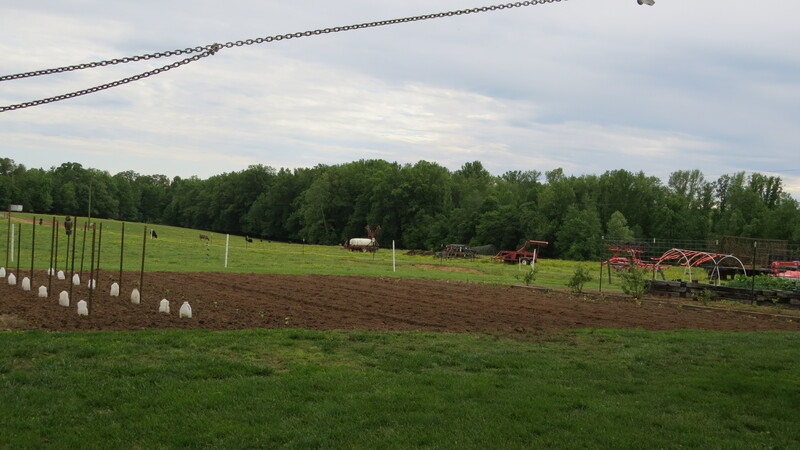 Back on the farm, he tilled my garden with the 6′ tiller so that I could plant. The ground was still wetter than I like but it is the middle of May and I still do not have my garden planted. The weather does not look good for another week or more so I felt I had to get it planted in this window of opportunity. The sun was bright and warm with a gentle breeze and by late morning the soil was nice and crumbly. 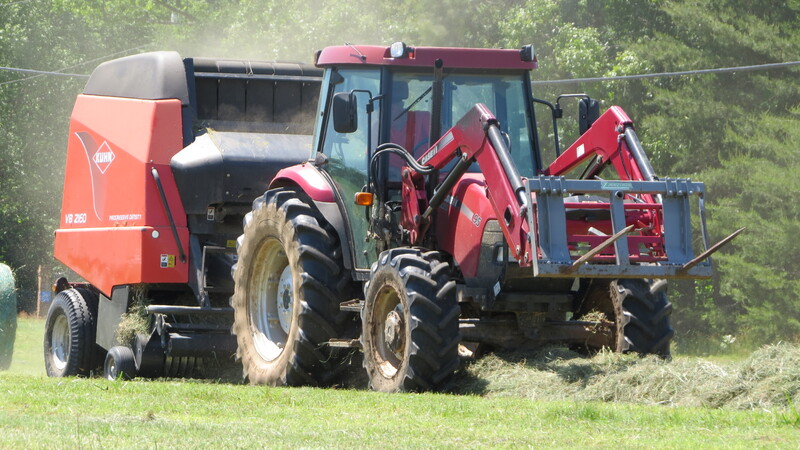 Just as he was heading to the field to rake hay, he got a call from Mr. Willis saying our big tractor that was in for repair was fixed. Gene was very happy for that call and left immediately to pick it up as he was really needing that tractor in the hay field. 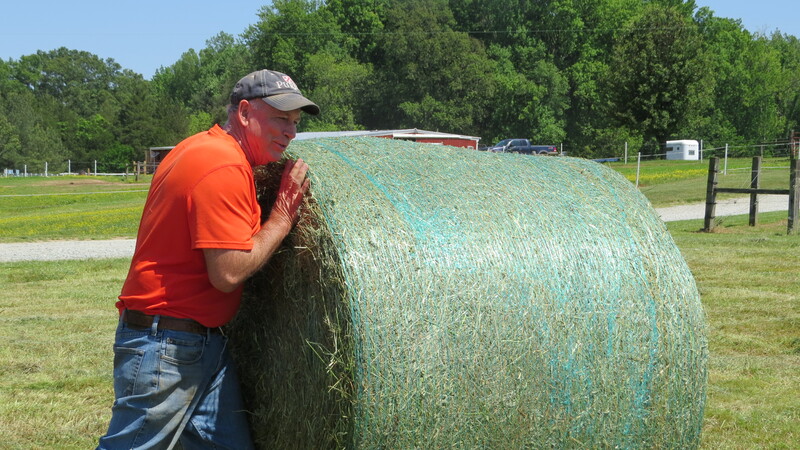 Back on the farm, he raked the hay, grabbed a bite of lunch and then baled the hay. 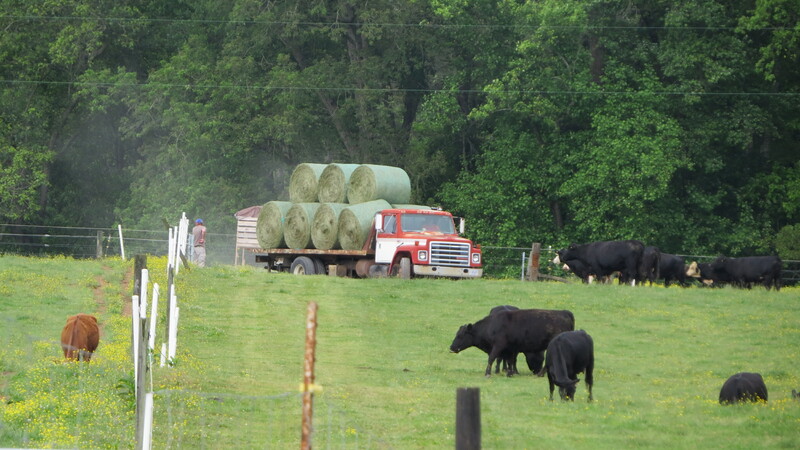 Just as he was finishing, Steve arrived from hauling a load of cattle to market and together they gathered the hay off the field. 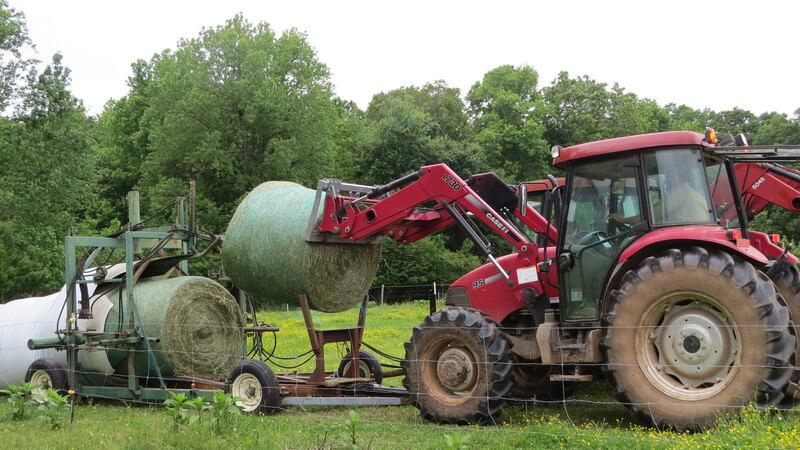 By 7 PM all 27 bales were tubed and sealed. Done! Me. I was just as busy. Between helping in the store and doing chores (fed the pigeons and hens, gathered eggs, and watered the greenhouse), I got my garden planted, strawberries, radishes, onions and asparagus picked, roses fed with Bayer 3-n-1 Rose Care, the bird feeder filled with seed, the deck swept and a strawberry pie with no crust (to help save calories since I am on a diet) made for supper. By supper time we were both exhausted, but like Gene said, “it was a good day”. My feet hurt and every muscle in my body ached. I didn’t get his usual help in the garden today and I had to push out my own rows but like they say, “I got ‘er done”!!! Let me tell you, it was an Advil night! After checking facebook and email, I crashed on the sofa and Gene stretched out in his comfy recliner. Next thing I knew it was 11 PM! Gene said I sure did seem to enjoy my snooze! If I had been awake, I can guarantee that I could tell you, he enjoyed his also!! !